War of Bets is similar to the game casino war. As in casino war, a single card is dealt to the player and dealer. However, the player may bet on either side to win, a tie, and various proposition bets on each card. As cards are dealt from the shoe, the winning odds are dynamically adjusted according to how many of each card is left in the shoe. Although the rule page states a single deck of cards is used, it appears to me to be a six-deck shoe. The dealer shall deal cards one at a time to a Player hand and a Dealer hand. Various bets are available, as shown below. The odds are dynamically adjusted after each card is dealt. The Player card is dealt first, with mid-state betting allowed before the Dealer card is dealt. 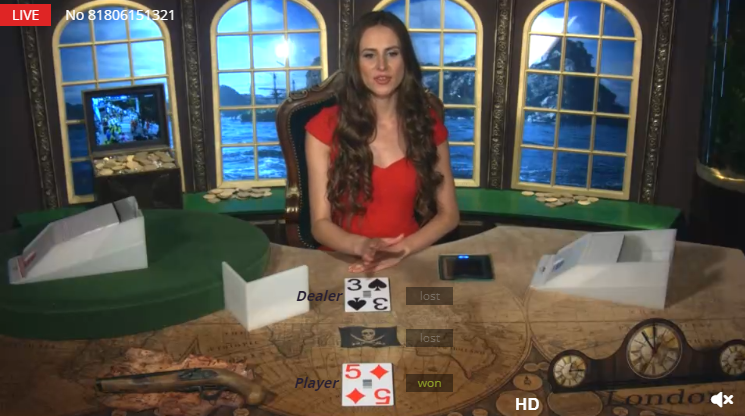 The dealer pauses for several seconds between cards to give the player an opportunity to bet. Player's card under 8, over 8, or exactly 8. Dealer's card under 8, over 8, or exactly 8. Player's card a face card or A-10. Dealer's card a face card or A-10. The odds seem are adjusted after each card to achieve a maximum of a 95% return. It seems to me the calculate the fair odds to achieve a 95% return and then round those odds down to the nearest 0.1%.